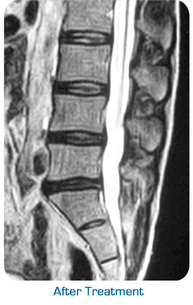 A herniated disc is a displaced fragment of the center part or nucleus of the disc that is pushed through a tear in the outer layer or annulus of the disc. Pain results when irritating substances are released from this herniated disc tear and also if the fragment touches or compresses a nearby nerve. Herniated discs has some similarities to degenerative disc disease or ‘slipped disc’ and discs that herniate are often in an early stage of degeneration. Herniated discs are common in the low back or lumbar spine and neck or cervical spine. Good news is the latest and most advanced form of non-surgical spinal decompression is now available. Many factors decrease the strength and resiliency of the disc and increase the risk of herniated discs. Lifestyle choices such as smoking, lack of regular exercise, weak muscles, poor posture, daily wear and tear, injury or trauma, and incorrect lifting or twisting further stress the disc and inadequate nutrition are contributing factors. If the disc is already weakened, it may herniate with a single movement or strain such as coughing or bending over to shave. Herniated discs are most likely to affect people between the ages of 30 and 40. Many times herniated discs may be asymptomatic (present without causing pain). The most common symptom will be pain in the area of the herniation that may radiate across the hips or into the buttocks or between shoulder blades and down the arm(s). You may also experience numbness or pain radiating down your arm or leg. 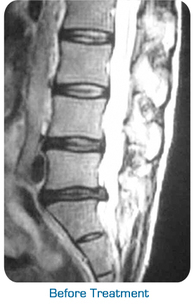 If the disc herniation is large enough, you may notice weakness. In severe cases of lumbar disc herniation, you may experience changes in your bowel or bladder function and may have difficulty with sexual function. How is herniated discs treated? Non-surgical spinal decompression. Mild to moderate herniated discs can usually be treated conservatively with first our non-surgical spinal decompression systems followed by core strengthening therapy combined with chiropractic care. Advanced cases of herniated discs will often require Non-Surgical Spinal Decompression, in conjunction with core stabilization and chiropractic care. Occasionally, herniated discs may be severe enough to necessitate surgical intervention. These cases are usually reserved as a last resort when other forms of therapy have failed. When you have a herniated disc, compressive forces cause your spinal bones to come together, basically devastating your disc. The space in between your bones decreases and the soft jelly-like disc materials squeezes out. The disc material that leaks out is called a herniated disc or a protruding disc, or and extruded disc and this squeezed out material can cause severe pain, numbness and tingling in your back, neck, arms or legs when the disc material pushes into and pinches the nerve. So here’s the logic: if you could slightly pull the compressed spinal bones apart, that would open up the space, take the pressure off of the disc, the disc bulge comes off of the nerve and solves the problem, makes sense? Historically, doctors have been trying to do exactly that with traction. Problem is that with traction has been proven to be rarely effective and often hurts. Traction rarely works because when you have a herniated or bulging disc, because the area is injured and when you try to move, your muscles go into spasm. Spasm is your body’s way of trying to protect you from causing further injury. That’s why traction is painful and ineffective. As soon as the traction starts, your muscles overprotect the area by muscle spasms. Here’s the good part: Now there is newer technology that outwits your body’s natural spasm reaction. In other words: It tricks the body! We use a Elite Chiropractic Table, its features are: Automated Lumbar 25 deg Flexion, Elevation with Traction, 25 deg Lateral flexion of the lumbar and thoracic sections, as you can see the table can move into all sorts of shapes to get the best line of force to address your particular disc bulge, position you in a comfortable manner to create a vacuum suction effect to pull the disc annulus bulge back into the centre of the disc. Spinal Flexion Traction Decompression is radically unlike from plain traction because it has timed flexion and lateral flexion technology that actually passively activates your spinal muscles, joints and nerve receptors. When you are strapped down the Chiropractor starts a gently pulling (traction), the Chiropractor immediately knows when your spinal muscles start to contract and stops pulling. As soon as your spinal muscles relax, the Chiropractor activates the Automated Flexion. The amazing thing is; the active flexion with traction avoids muscle spasms, you don’t even know what is going on. Translation: you don’t feel any pain! In fact, the only thing most people feel is gentle pulling, gentle up and down motion, and NO PAIN! 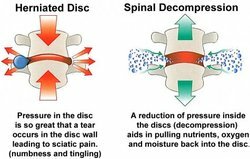 But even better part is: Spinal Decompression is able to lightly decompress your spinal bones which in many cases, actually moves that disc bulge back into the disc, rehydrating the injured disc so that it can heal as you would expect. The treatments are pleasant and straightforward. All you have to do is lie down, listen to your favorite music or take a snooze. The astonishing technology does everything while you simply unwind the pain!